Using PLA and Slic3r, I have a slight issue with puckering on the top layer (see image). I say slight issue because for the most part it has not caused me any functional problems, only visual ones. I can get rid of most of it with a file. Question is, how should I go about getting rid of this. In slic3r, I have played around with the extrusion multiplier and that doesn't seem to fix the issue and sometimes causes other issues. (clearly I don't know what I am doing with it). Is there a good way to address an issue like this? Wow! What a picture! I thought it was from the Chinese probe that landed on the far side of the moon! It looks pretty heavily over extruded to me. I guessing you slowed print speed down for small perimeters which is why the holes look OK, and used concentric infill on the top solid layer at a relatively high speed. 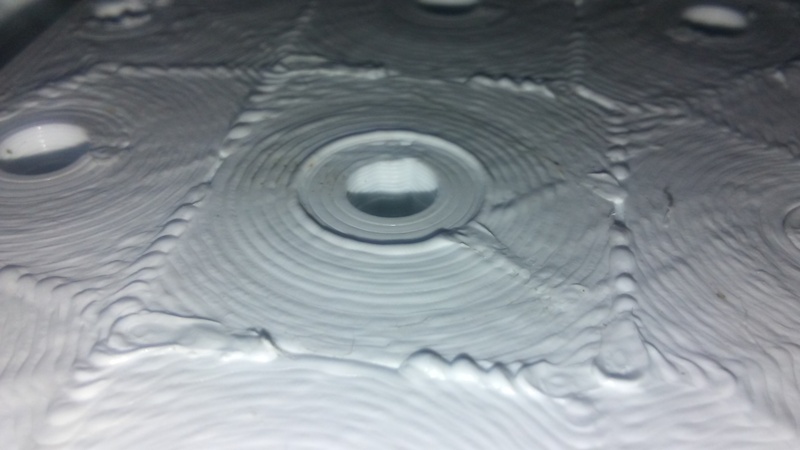 When you do that the small circles that surround the holes get printed so fast that the plastic doesn't have time to cool before the next concentric fill line is placed right next to it which results in the plastic building up as it gets pushed aside by the plastic coming out of the extruder. As you get farther from the holes the concentric fill takes longer to put down so it has a little more time to cool before the next concentric line is put down next to it, so the plastic doesn't get pushed aside like it does on the smaller circles. Thanks. I will cut the extrusion multiplier a bit and look at my speeds. I have to admit that the speed settings for me are a bit of a dark art. Based on your response, I think I can come up with a small piece to use as a testing print and play around with the settings.